Thallus: shrubby, compact, 2-10 cm long branching: isotomic-dichotomous, branches divergent basal part: distinctly paler than branches or of same color, with numerous and conspicuous annular cracks branches: usually ±irregular, lateral branches not narrowed or slightly to distinctly narrowed at point of attachment segments: terete to distinctly ridged, cylindrical to weakly sausage-like; foveoles: absent; transversal furrows: absent apices: short, thick, usually sparsely branched papillae: absent tubercles: absent fibercles: low, numerous, mostly sorediate fibrils: short (1-3 mm) often spinulous, mostly present in oldest part of thallus soralia: punctiform, smaller than half the diameter of branches, densely disposed, slightly stipitate, arising on fibercles isidiomorphs: on soralia or isolated on plain cortex, sometimes on ridges, frequently black pigmented at tips cortex: moderately thin (5-9%), shiny, distinctly transversally, and longitudinally cracked at the base of main branches medulla: compact to dense and often orange pigmented close to the axis axis: thick Apothecia: rare Spot tests: medulla K+ yellow turning red, C-, KC-, P+ pale orange-yellow Secondary metabolites: cortex with usnic acid; medulla always with norstictic and salazinic acids, and almost always with galbinic acid. Substrate and ecology: growing mainly on acidic and volcanic rocks, rarely on limestone, very rarely on bark, usually in shady situations, in mixed pine-oak-juniper forests or in canyons, between 200 and 2530 m World distribution: southern North America Sonoran distribution: eastern and southeastern Arizona, Baja California Sur, Chihuahua and Sonora. 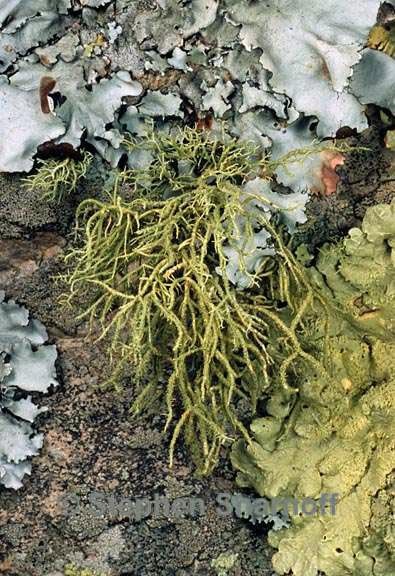 Notes: Usnea amblyoclada is closely related to U. dasaea, and they differ ecologically (the latter species grows primarily on bark) and morphologically (mainly through their different type of soralia and isidiomorphs). For differences from U. shimadai, see under that species.